American Mandolin, Gibson Mandolin-Guitar Company, Kalamazoo, 1923, Model F-5, labeled PATENTED MAR 30 1906-, SEPT 20 1920-JAN 18 1921, THE GIBSON MASTER MODEL, STYLE F5 NUMBER 72206, IS HEREBY GUARANTEED... 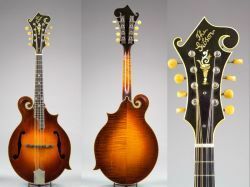 etc., GIBSON MANDOLIN-GUITAR COMPANY, KALAMAZOO MICH USA and THE TOP BACK TONE BARS, AND AIR CHAMBERS OF THIS INSTRUMENT WERE, TESTED TUNED AND THE ASSEMBLED INSTRUMENT TRIED AND, APPROVED FEB 26, 1923, and signed LLOYD LOAR, ACOUSTICAL ENGINEER and VIRZI TONE NO. 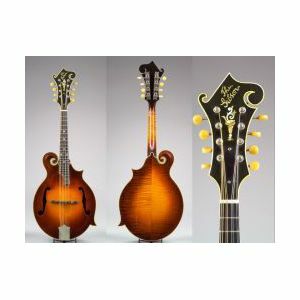 10445, the bound quartersawn two-piece back of narrow curl, the sides of irregular curl, the neck of strong medium curl, the bound peghead with THE GIBSON and flowerpot pearl inlay, the bound ebony fingerboard with pearl dot inlay, length of back 13 3/8 in., with original rectangle case.